So, having acquired a some blank atmega328p chips and several basenode kits, I wanted to find a way of programming the blanks without buying an ISP programmer (yes I know they only cost a few £'s but that wasn't the point). 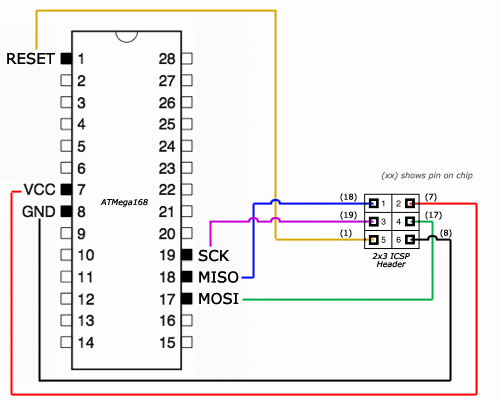 So I wired two jeenodes together with all pins going to the same except pin 16 of the donor chip going to the reset pin 1 of the receiver chip and followed the instructions in https://www.arduino.cc/en/Tutorial/ArduinoToBreadboard on burning a bootloader. Hit the button - and it worked! Here's the back and front of my rudimentary programmer. It set fusebits to FF DA FD CF. where have the images gone? they were there for a few days - but now disappeared - were they too large?